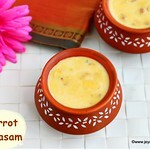 Carrot payasam with milk and jaggery as main ingredients makes a perfect dessert and apt for festivals too. We generally make carrot kheer with milk,sugar and condensed milk. I wanted to try this carrot payasam with jaggery,as Tamil New Year 2018,is tomorrow,14th April, i thought i will share the recipe today. I first thought i will make the carrot payasam using coconut milk,then finally made this payasam with milk and jaggery. I loved the taste of the payasam and the family to loved it. 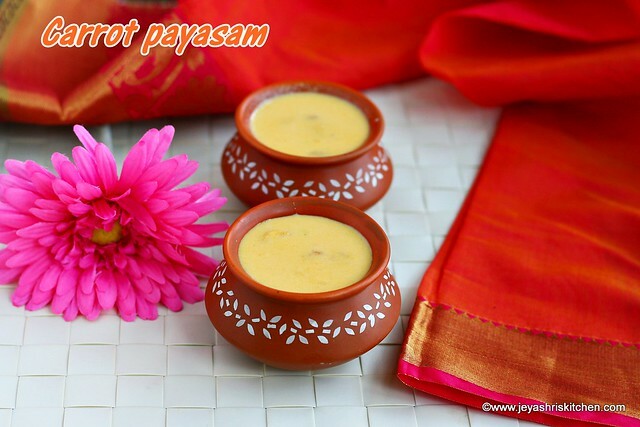 For a change from the usual paruppu payasam or paal payasam try this carrot payasam for the upcoming festival and delight your family. Check out my complete collection of Tamil new year recipes. 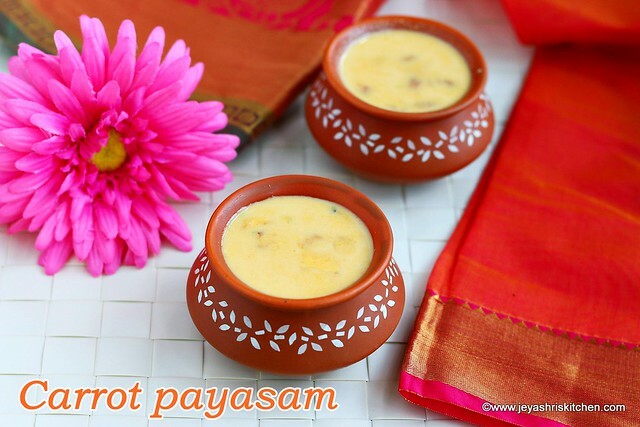 Carrot payasam with milk and jaggery as main ingredients makes a perfect dessert and apt for festivals too. *You can reduce to 1/2 cup also. In a pan add ghee and roast the cashew nuts till golden brown and keep aside. Add jaggery in a pan. Add 1/4 cup of water to this. Boil this till the jaggery is melted completely and boil for 5 minutes. Peel the skin of the carrots and wash it nicely. Roughly chop this and pressure cook this for 3 whistles adding little water or milk to this. Cool down and puree this in a mixie. In a heavy bottomed pan add the carrot puree and the milk. Mix well and boil this for 10 minutes in a medium low flame. Filter the jaggery syrup and pour on to the carrot milk mixture. Mix well. Do not on the flame,it will curdle. Add the roasted cashew nuts and the cardamom powder. Add the roasted cashew nuts and cardamom powder to this. Carrot payasam is ready to serve. This carrot payasm with the sweetness of jaggery and the crunchiness of the nuts,is a perfect one for neivedyam and parties too. Add the jaggery mixture after the milk is cool completely. You can add a pinch of Edible camphor to the payasam. You can grate the carrots and roast in ghee and then add milk to this and cook. You can add some roasted coconut bits to the carrot payasam.